18 February 2014 | Food has become a new battleground for airlines with almost any major airline collaborating with a high-profile Michelin-star chef in order to lift the quality (and add credibility) of their inflight menus in Business and First. Besides upping the ante when it comes to the quality of food served to their premium passengers, airlines such as Turkish Airlines, Austrian (both served by DO&CO), Etihad and Gulf Air employ so-called Sky Chefs in order to provide an extra dimension to the inflight dining experience. Although the limitations of the onboard galley equipment allows onboard chefs to prepare little other than for example a fresh omelet egg for breakfast, they can customize the meals to passengers’ preferences, add a little culinary theater when serving the meals, and are more experienced in the precise handling of the galley equipment. Estonian Air, meanwhile, a few years ago came up with an innovative twist of the onboard chef concept. During one year, the airline each month asked a different Estonian restaurant to prepare a Business Class menu with the restriction that all participating restaurants had to stay within the same budget that Estonian Air reserves for its catering company, LSG Sky Chefs. Furthermore, each restaurant chef personally presented his or her menu to passengers onboard a monthly ‘gourmet flight’. On a similar ‘experiential’ note, Virgin Australia in October 2013 surprised passengers on board a flight from Sydney to Perth with a traditional tiered-tray high tea service at 40,000 feet, designed and served by the airline’s resident chef, Luke Mangan. 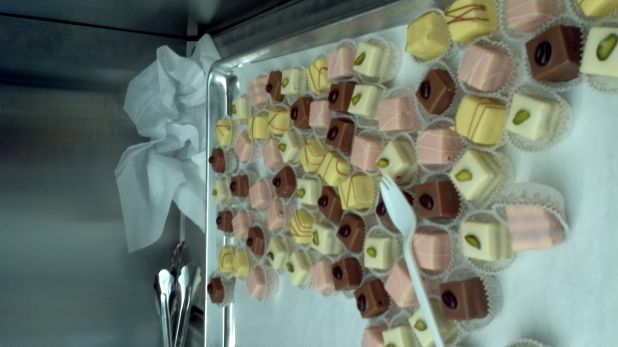 Air France, meanwhile, had Michelin-starred French chef Michel Roth unveil his new gourmet creations to Air France Business class customers on board a Paris-Montreal flight in early 2013 (video here). The airline has also listed Colin Peter Field, head bartender at the famous Hemingway Bar of the Ritz Hotel in Paris, to mix inflight cocktails for customers in La Première and Business class in November 2013 in what it called “Bar Hemingway in the Sky.” This collaboration will be continued in March of this year on an Air France flight from Paris to Tokyo, with additional destinations in 2014 to include Hong Kong, Sao Paulo, Shanghai, Moscow, Singapore, and Seoul. 3 April 2013 | If you like the life jacket the flight attending is showing during her emergency presentation, you might want to check out Air France’s new cooperation with the French upcycle brand bilum. Both brands are presenting a collection of travel cases made from recycled life jackets and old advertising posters that were on display at Paris Orly airport in spring 2012. As all life jackets have a limited lifespan, Air France has asked bilum to give them a new life, rather than destroying them. This partnership fits into Air France’s philosophy to reduce its environmental impact and to give something back to certain communities. The first collection of 400 cases made from life jackets were launched in December 2012 and are available for sale online at Air France and Bilum at a price of 19 euros for the flat case and 24 euros including tax for the padded case. For the moment you can still buy bags and ticket wallets made from the giant Air France canvas posters dating from summer 2012. The posters show a girl lying in the green grass on a bed of flowers in the shape of an airplane. Prices range from 69 euro to 285 euro for a bag. All cases from bilum are manufactured in France by people with disabilities as part of a work insertion scheme by the E.S.A.T., a French organisation that aims to integrate people with disabilities into the mainstream labour market. They are hand-cut from a piece of the jacket or poster and the fabric is not changed in any way, so that each case is unique. No two items are the same. 11 February 2013 | There is nothing new about celeb chefs inventing special dishes for airlines but recently Air France took it a step further by inviting a chef on board to present in person his new creations. In the past, Estionian Air already took famous Estonian chefs on board to enhance the culinary experience of its customers, now Air France is following. Recently, Michelin-starred French chef Michel Roth unveiled his new gourmet creations to Air France Business class customers on board a Paris-Montreal flight. During this flight, passengers were able to taste four dishes prepared by the Michelin-starred chef and two Servair chefs Michel Quissac and Roger Passet. The three chefs then replied to passengers’ questions and shared their passion with a view to making this in-flight gourmet experience an exceptional interlude (video here). Starting from 1st February 2013, Michel Roth will offer six new dishes on board long-haul flights departing from Paris. The chef’s new dishes will be served for a period of 8 months and will be one of the four main dishes on the menu. Also the creation will be renewed twice a month for the pleasure of frequent travellers. 3 December 2012 | Since the launch of its ‘Air France Music’ initiative in 2010, the airline has built a reputation for offering passengers and its social media fans and followers exclusive musical content such as exclusive podcasts and ‘on air’ playlists of the music it play on board its aircrafts. In November 2010, the airline also took three bands – The Shoes, Monsieur Monsieur and Alb – on an Airbus A380 flight from Paris to Tokyo, with each act composing and recording a new track while in the air. According to Air France’s SVP Corporate Communications Adeline Challon-Kemoun, “music plays a central role in brand communication” for the airline, with the app being a way to “evoke the relaxed serenity of air travel” through music. Following its ‘Side by Side’ Facebook iniative earlier this year, Air France recently launched its latest musical initiative, a global mobile music discovery app. Air France ‘Music in the Sky’ is an app for iPhone and iPad that allows users to ‘capture’ new tracks by pointing their devices upwards to the sky. The app uses an augmented reality element so that songs show up on the screen as little dots with music notes inside them. Users can then capture a song and add it to their playlist. ‘Music in the Sky’ also features different tracks in each country, so frequent travellers can discover more music through the Air France Music mobile platform. Additionally, users can test their music knowledge on the app to win “other unreleased tracks, concert tickets or even air tickets” by finding hidden games in the sky during certain times of the year. Video of the ‘Music in the Air’ app here. 10 March 2012 | Besides taking measures to significantly reduce fuel consumption by flying new and re-engined aircraft, experimenting with biofuel, creating more economical flight paths and descents, applying winglets and nano paint in order to streamline aircraft even further, and reducing weight of cargo containers and cabin interiors (e.g, seats, trolleys), airlines have also come up with eco-initiatives that are more visibile to passengers, most notably onboard recycling. Air France, which says it already recycles that 80 percent of the items used for onboard service, has now come up with a small, but sympathetic initiative, that shows passengers that it makes an effort to recycle as many items as possible. The airline recently began asking passengers on domestic and European flights to drop their free newspapers in a dedicated container when leaving the aircraft. Local businesses then collect the newspapers and recycle them. According to the airline, tests carried out with customers show that over 75 percent of passengers place their newspapers in these containers. Air France says it also seeks to recycle its polystyrene meal boxes that are distributed on its European routes. Meal packs on medium-haul Air France flights are made of recyclable polystyrene and cabin crew collect and sort the used packs, which when recycled by the supplier are used to make Air France cutlery. 7 April 2011 | In recent years, gourmet food trucks have been all the rage in the U.S., serving up all kinds of high-end cuisine, ranging from Korean BBQ to upscale desserts, while using Twitter to let customers know where they will be parking on any given moment. To promote the airline and its service, Air France has also jumped on the food truck ‘trend’ and for 5 days (March 24th through March 28th) an Air France ‘Gourmet Food Truck’ toured Manhattan, New York, serving complimentary food. Chefs from airline caterer Flying Food Servair handed out free food samples based on the recipes of Air France’s Michelin-starred chef Joël Robuchon. Items on the menu included Pain au Chocolat for breakfast, cucumber and smoked salmon brochette (lunch), French Shepherd’s Pie with duck confit (dinner) and assorted French macarons and petits fours as a dessert. Parked in one location per day, the Air France food truck could be found at respectively Rockefeller Center, Union Square, SoHo/Broadway and Wall Street. The exact location could be followed via Air France USA’s Twitter stream and Facebook page. An estimated 600 samples of breakfasts, lunches and dinners were served each day during the promotion. There was also a sweepstakes for two Air France tickets to Paris, and those who received a free meal were encouraged to make a donation to City Harvest, a rescue organization dedicated to feeding New York’s less fortunate citizens. 12 November 2009 | Air France has anounced it will restructure its European service to counter the loss of passengers to low-cost carriers and to make its short and medium-haul business (which account for 40 percent of its revenue) profitable again. Air France says the new European product will increase its market share by lowering its cheapest fares with 5 to 20 percent (depending on the route) and its most expensive tickets with 19 to 29 percent. Customers will also be allowed a greater flexibility to change bookings. The restructuring also means lower operating costs for Air France, for example by serving simpler meals and increasing the number of internet bookings. 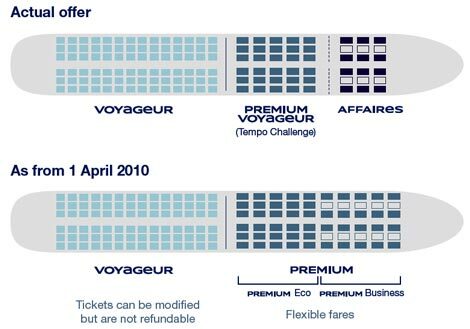 Air France’s new Europe product will come into affect from April 2010, with tickets on sale in January. According to Air France, its customers (passengers, travel managers and travel agents) all indicated they want two clearly differentiated products for short-haul air travel. At the one hand, they want a simple and inexpensive economy product, and on the other hand a more affordable premium product, for those that require additional flexibility, more comfort and a more efficient journey. According to Air France CEO Pierre-Henri Gourgeon “regarding short-haul travel, customer requirements have changed. They now want reliable, efficient air transport, with an appropriate service, at the lowest possible price, while retaining the Air France touch”.